SNES Chrono Trigger (USA) "newgame+" in 09:07.12 by inichi. However, this movie is different, because it starts from New Game +, which means that the equipment and character stats are preserved from a previous game completion. This run uses a save file which is specifically optimized for an optimal New Game + completion of the game; thus this run should be considered more as a concept demo than as a rule-conforming TAS. This beats the game with perfect characters and best equipment in a very short time. 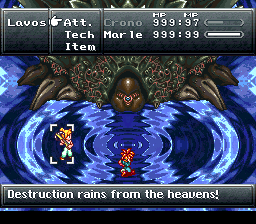 The actual time from power-on until the death of the last boss is only about 7 minutes, but the ending demo does not start until the Dream Team scene (part of the ending) is completed. The micro gate in the right-side teleporter is only available in New Game +. In this 22.71-second improvement to the previous version, menu screens are entered in screen transitions to save time. Other improvements were also found.